When you think of world renown composers of music, one of the first names that come to mind is Aram Khachaturyan. The entire world knows him as the composer of the Sabre Dance. Aram Ilych Khachaturyan was born June 6, 1903, near Tiflis, Georgia. During his childhood, Aram heard Georgian, Armenian and Azerbaijan songs in the streets of the big southern city from morning to night, and these melodies became early impressions deeply engraved in the memory of this gifted child. Khachaturyan began to study music at the age of nineteen, and he began to play the â€œcelloâ€�. He went to Moscow and entered the Gnesin School of Music, where he studied both composition and conducting, and by the time he was thirty he was playing at the Moscow Conservatory. Khachaturyanâ€™s music was noted for being cheerful, rhythmic, and sensuous. His musical idiom had roots deep in folk music, and most of his compositions, large and small, were imbued with the spirit of national art, and yet he seldom, if ever, quoted folk melodies. As an internationally renowned composer, his works included Dance Suite, Sabre Dance, and the ballets Gayane, Happiness, Masquerade, and Spartacus. He also composed several symphonic pieces, music for films and plays, and choral numbers. His native Armenian heritage is stirringly reflective in his melodies, rhythms, and pulsating vitality. Khachaturyan was considered the founder of a new symphonic school based on the inexhaustible wealth of Transcaucasian folk song. He was the first Armenian composer to create large-scale lyricoepic symphonic works addressed to his contemporaries. His Symphonies, as well as his concerts and symphonic poems, were comprehensible to millions of listeners. The period from 1935 to 1941 was among his most fruitful. He completed his postgraduate studies at the Moscow Conservatory, wrote and successfully performed his piano concert, and composed incidental music for two films, Pepo and Zangezur. The composer kept in close touch with Armenia and was elected deputy to the Armenian parliament. He was appointed to executive positions in the organizing committee of the Composers Union. Khachaturyan was awarded the Order of Lenin for his music for the ballet Happiness, performed during a ten-day festival of Armenian music in Moscow. For some time Khachaturyan had been dreaming of conducting an orchestra. He had rehearsed with small orchestras in theaters staging plays with his music. His dream finally came true in 1950, when he conducted a full orchestra. In the summer of 1957, Khachaturyan and his wife made an extensive tour of the Latin-American countries. During his three-month visit, he conducted 12 concerts of his works, performing the Second Symphony, the Violin, Piano and Cello concerts, and the Gayane, Spartacus, and Masquerade suites. Khachaturyanâ€™s performance received very high praises from the Latin-American critics. Khachaturyanâ€™s seventieth birthday, June 6, 1973, was widely observed. Booklets on his life and work were published in Moscow and Yerevan. Jubilee concerts of his music were held in the Grand Hall of the Moscow Conservatory, the Tchaikovsky Concert Hall, and the Hall of Columns. There was a large exhibition of photographs in the lobby of the Conservatory, and the Bolshoi Theater gave a special anniversary performance of Spartacus. In 1968, he toured the United States, visiting several cities and conducting orchestras in concerts consisting entirely of his own compositions. The concerts turned out to be very successful. Aram Khachaturyan married composer Nina Makarova, who had studied with him in the Myaskovskyâ€™s composition class. They had one son. This was his second marriage. By his first wife, the pianist Ramella Khachaturyan, he had a daughter, named â€œNuneâ€� for whom he always showed a touching concern. She too became a pianist and music teacher at the Moscow Conservatory Music School. Khachaturyans favorite Armenian dish was â€œDolmaâ€�, minced meat with rice wrapped in tender grape leaves and boiled. Aram Khachaturyan died on May 1, 1978. Thousands filed by his body as it lay in state in the Grand Hall of the Moscow Conservatory, and later in the Opera and Ballet Theater in Erevan. Since it is difficult to establish a reliable chronology of Khachaturian's compositions, in this catalogue they are grouped by genre. To keep the catalogue within manageable limits, arrangements â€” of which the number is extremely large have been omitted. The basic reference source is D. M. Person, A. Khachatunan: noto-bibliograficheskii spravochnik (Moscow, 1979). Numerous additions, corrections and amplifications have been culled from Aram Khachaturian: Collected Works in Twenty-Four Volumes (Moscow, 1982- ). Works included in this edition are indicated by '(CW)' with the volume number. Thanks to the generosity of the editors at the State Publishers "Muzyka," I have been fortunate in examining materials from as yet unpublished volumes in the series. I am also grateful for the invaluable assistance of Devil Amiakovich Arutiunov, the leading Soviet specialist on the music of Khachaturian, Karen Aramovich Khachaturian, the composer's son, and representatives of the All-Union Copyright Agency (VAAP). Suite from music to Lope de Vega's Comedy "The Valencian Widow"
First Suite from the ballet "Gayaneh"
Second Suite from the ballet "Gayaneh"
Third Suite from the ballet "Gayaneh"
Suite from music to Lermontov's drama "Masquerade"
Suite from music to the film "Battle of Stalingrad"
First Suite from the ballet "Spartacus"
Second Suite from the ballet "Spartacus"
Third Suite from the ballet "Spartacus"
Suite from music to Lavrenev's play "Lermontov"
March from the film "Zangezur"
'Song of Pepo,' from music to the film "Pepo"
'O My Garden,' from music to the film "The Garden"
'Nina's Romance,' from incidental music to "Masquerade"
'The Baltic Sea,' Rybakov's romance from incidental music to "The Kremlin Chimes"
'Song of a Hero,' from incidental music to "Ilia Golovin"
'My Native Land,' from music to the film "They Have a Native Country"
'Marching Song,' from music to film "Admiral Ushakov"
'Song of Russian Sailors,' from music to film "Ships Storming the'Bastions"
'Song about the Willow,' from music to film "Otello"
'Desdemona's Vocalise,' from music to film "Otello"
'Soldier's Song,' from music to film "Otello"
'Peace March,' from music to film "The Tocsin of Peace"
Copyright Â© 1987-2000 by G. Schirmer, Inc.
Sale items are available from your music dealer. When once asked about his being close to Russian or Armenian culture, he answered:"My every note screems that she is an Armenian". A signed document from eBay. PanARMENIAN.Net - A two-hour-long documentary about Aram Khachaturian was screened at the hall of the Egyptian Theatre in Hollywood on the occasion of the composer’s 110th birthday, Asbarez reports. The documentary traces the tumultuous career of the great composer, while also exposing the harsh realities of the Soviet regime for artists. The screening was organized by joint efforts of the Armenian Diplomatic Representation in Los Angeles and the ARPA Film Festival. Aram Khachaturian’s career and life were presented through his and his friends’ memories: his passion for classical music, his first achievements and first failures, betrayal of friends and struggle against the vicious environment. The authors of the film, Dora and Robert Kuhn, present all this with details that had been unknown up until now. “My wife is a pianist and she presented Khachaturian’s Violin Concerto in about 40 countries from Chile to China. The Saber Dance is probably his best known work, and our wish was to make him better known in a wider aspect. Director Peter Rosen realized our initiative in a political context by presenting a story about Kkhachaturian’s Armenian spirit, his great creative potential and the cruel Soviet reality,” Robert Kuhn said. Exceptional archive materials have been used in the film, part of which had never been screened before. There are also memories of Aram Khachaturian’s contemporaries and interviews with those who later betrayed the composer. “I’m in love with Khachaturian’s music forever. His Violin Concerto has been my visiting card all over the world. I wanted everyone to get to know him deeper, to know that he is Armenian and has always been close to his roots. I think he would like the film,” Dora Kuhn said. The film about Khachaturian has been presented at tens of festivals and won the first prize at the Hollywood Film Festival. It will be screened in a number of countries in the future, Dora Kuhn said. According to her, the film is a great story about a great man, which lives its own life. PanARMENIAN.Net - A leading Russian film company is preparing to start filming the first-ever feature film about world famous Armenian composer Aram Khachaturian, Rusarminfo reports. "Saber dance", as the movie is aptly called, was written and will be directed by Yusup Razykov, while Ruben Dishdishyan's Mars Media is attached to produce. Production will begin in 2018 and will take place on the territory of Russia and Armenia. "The film is set in 1942, when the Kirov (Mariinsky) theater was evacuated to the Urals, where Aram Khachaturyan had just finished composing the ballet 'Gayane'", Rusarminfo cited company representative Tigran Manasyan as saying. In all probability, the movie will hit theaters in late 2018 or early 2019. 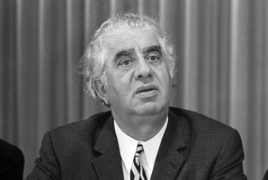 Khachaturian was the most renowned Armenian composer of the 20th century and the author of the first Armenian ballet music, symphony, concerto, and film score. He is highly respected in Armenia, where he is considered a "national treasure". World famous Hollywood actor John Malkovich is set to visit Armenia to attend the solemn opening ceremony of the 5th Aram Khachaturian International Festival in capital city Yerevan, the press service of the State Youth Orchestra of Armenia told Panorama.am. The opening of the festival will take place at Aram Khachaturian Concert Hall on October 11. The renowned actor will perform with the State Youth Orchestra of Armenia. The big poster of world famous John Malkovich appeared on the wall of Aram Khachaturian Grand Concert Hall in mid-August, and people were wondering: what could a Hollywood star have to do with State Youth Orchestra of Armenia on the same stage? Alfred Schnittke’s music and Ernesto Sabato’s literature are going to unite the State Youth Orchestra and Malkovich within the frames of 5th Aram Khachaturian International Festival. 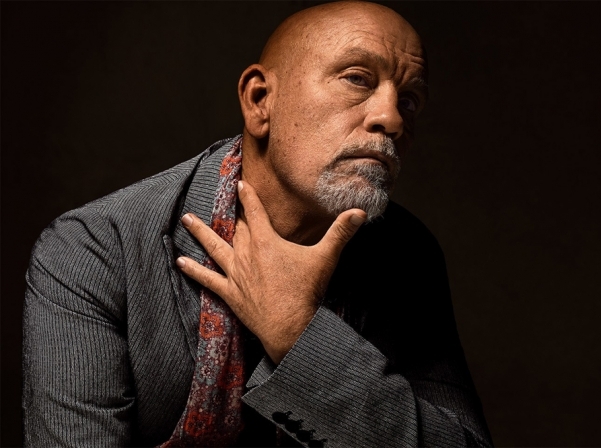 The project was implemented in a number of countries, so the orchestra have already had the chance to cooperate with Hollywood legend Malkovich. According to the orchestra’s Artistic Director and Principal Conductor Sergey Smbatyan, Malkovich is familiar with the Armenian history, and they had discussed the idea of his visit to Armenia during the meetings before. On October 11 John Malkovich and the Armenian musicians will together introduce the audience to two works: Alfred Schnittke’s Concerto for Piano and String Orchestra and an extract from “Report on the Blind” of Ernesto Sabato’s novel “On Heroes and Tombs” (with Armenian translation on the screen). “There will be nothing but the presence of orchestra, musicians and John Malkovich. We will not use any conceptual theatre effect, since Malkovich is the one to create theatre. The lights were off during the international premiere of this project in Seoul. People did not know what John Malkovich was going to do, yet his aura was so strong, that they immediately felt his presence once he appeared on the stage, ” Sergey Smbatyan told Mediamax. Smbatyan said that it is a great honor for the State Youth Orchestra to host one of the most famous and distinguished Hollywood actors not as a guest, but as a professional and present a joint project with him. 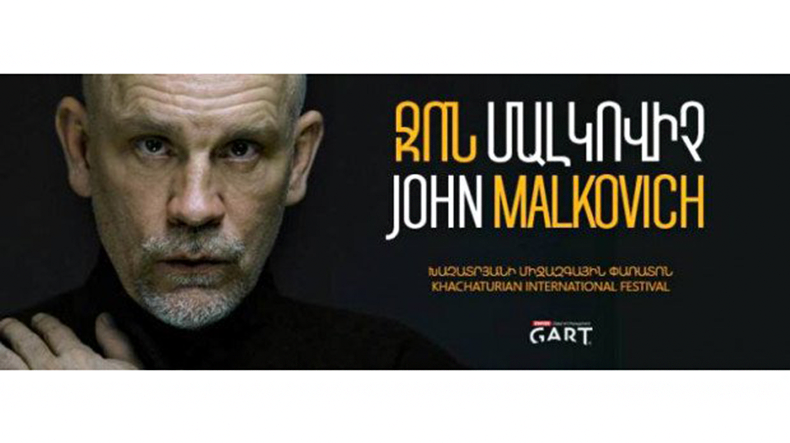 Malkovich will arrive in Armenia the day before the performance. He has already worked with the orchestra, so there is no need for long preparations. “Working with a teammate like Malkovich, who lives, thinks and creates on the stage is always an unpredictable yet great experience. You witness how he creates the values that people like and cherish. I am happy for hosting in Armenia this non-entertainment project, and I would love to see people coming to the concert not just to see John on the stage but to hear and understand what an important message he has to deliver,” Sergey Smbatyan said. Within the frames of the 5th Aram Khachaturian International Festival, the Armenian audience will be able to listen to Serj Tankian's Orca Symphony No. 1 for the first time. Headed by Sergey Smbatyan, Pan-Armenian Symphony Orchestra performed an extract from this work on April 24 this year. “Tankian is one of the greatest and most famous musicians in the world, and Armenian youth follows his activity very attentively. We want to show them that Tankian attaches special importance to classical music, since he decided to write a piece for Symphony Orchestra. We are trying to prove that classical music can also attract the audience,” Sergey Smbatyan said. 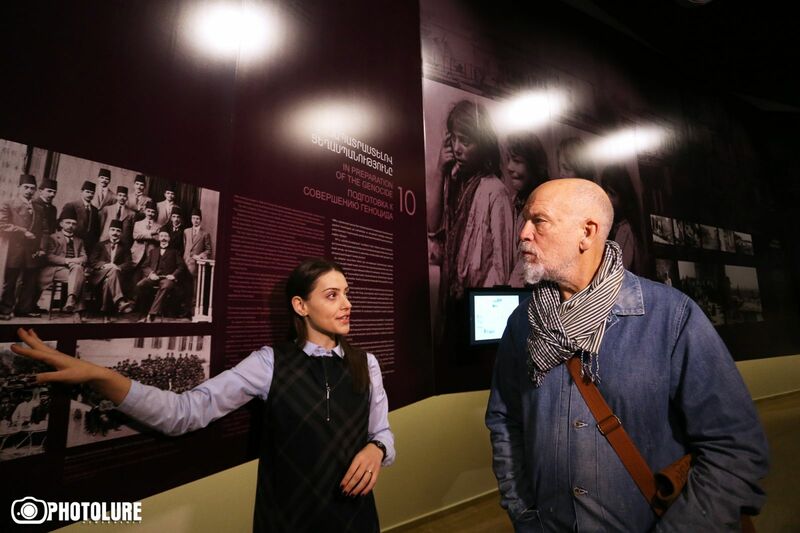 World famous American actor, producer, film director and scriptwriter John Malkovich today paid a visit to Tsitsernakaberd Memorial Complex to pay tribute to the memory of the Armenian Genocide victims. 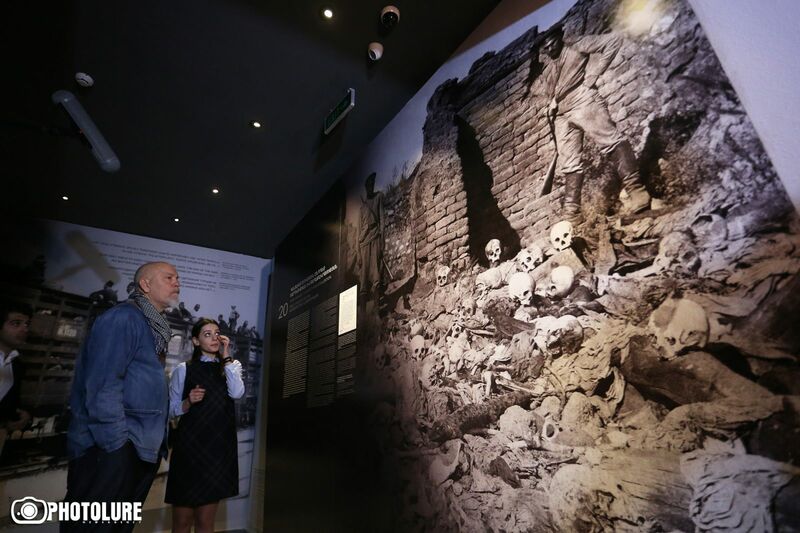 Afterwards the Hollywood star visited the Armenian Genocide Museum-Institute. 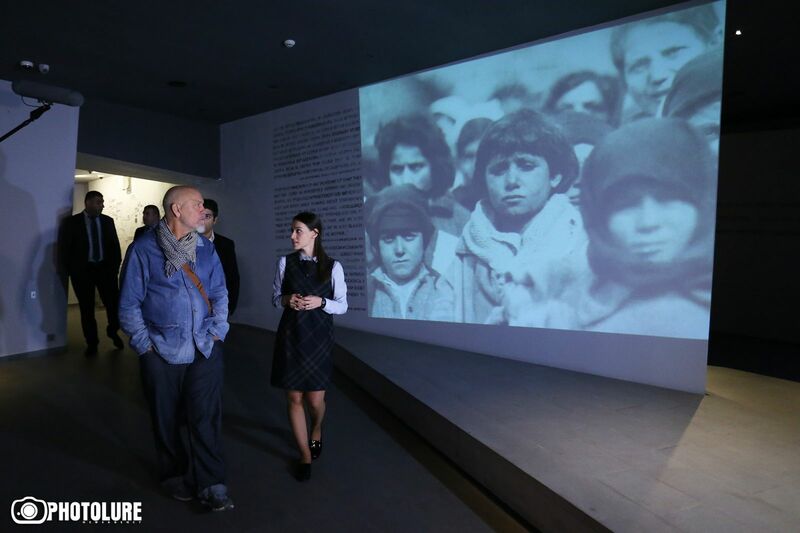 Earlier, during Monday’s news conference, when asked whether he is aware of the Armenian Genocide, John Malkovich said he has heard about it and that he is astonished at the terrible things people are capable of doing. To remind, John Malkovich has arrived in Armenia to perform at the solemn opening ceremony of the 5th Aram Khachaturian International Festival scheduled for 11 October. The Hollywood star, together with the State Youth Orchestra of Armenia, will offer a chapter from Ernesto Sabato’s “On Heroes and Tombs” novel jointly performed with the Concerto for Piano and Orchestra by Alfred Schnittke, one of the most eminent musical figures of the second half of the 20th century. The soloist pianist is Anastasya Terenkova. 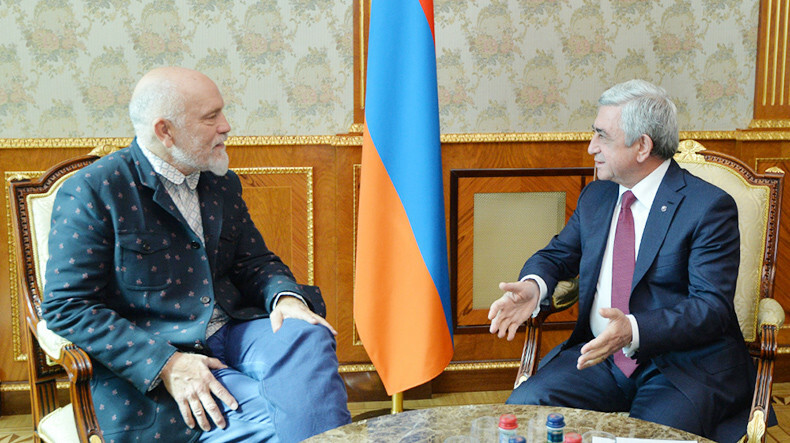 Armenian President Serzh Sargsyan received today famous Hollywood actor, scriptwriter and producer John Malcovic, who is in Armenia to attend the opening ceremony of the 5th Aram Khachaturian International Festival. press department at the President’s Office reported. Welcoming the guest, the President noted that it is a great pleasure to host a talented artist in a country where the art power is highly valued, and its people have been able to create a great cultural heritage and contribute to the development of human civilization for centuries. “I know that Armenian audiences will have the opportunity to enjoy your art, a unique manifestation of your talent, where music and literature are closely intertwined. I am confident that your participation in the opening ceremony of the 5th Aram Khachaturian International Festival will remain in the memory of the Armenian audience forever,” the President of Armenia said and expressed the hope that during his short visit to Armenia, John Malcovic will have an opportunity to better understand our country, its rich historical-cultural heritage and the hospitable Armenian people, who have always had deep respect for talented people. Thankful for the reception, John Malcovic thanked the President for his kind remarks, hospitality as well as for the support and attention paid by the President to the development of culture in Armenia, including the State Youth Orchestra of Armenia with whom he has arrived in Armenia in the frame of a cooperation program. The famous artist said to be impatient to present a concert jointly with artistic director and chief conductor of the orchestra Sergey Smbatyan and expressed the hope that it would be welcome in our country, the release added. chance to invite the maestro, with his spouse, to his home. the mushroom soup very much, and Hemingway offered a second portion. the Hemingway museum in Cuba. finishing a book. However, Hemingway’s wife Mary attended the concert. and Che Guevara also attended the concert. community there, and certainly many were willing to meet the composer. Khachaturyan museum on the 100th anniversary of the composer’s birth. hosted by a famous Brazilian Armenian – Tiran Mostijyan. hands and asked Khachaturyan to leave his signature on the piano.